In celebration of the fiftieth anniversary of the publication of Silent Spring, here is a biography of the pioneering environmentalist. "Once you are aware of the wonder and beauty of earth, you will want to learn about it," wrote Rachel Carson. She wrote Silent Spring, the book that woke people up to the harmful impact humans were having on our planet. Silent Spring was first published in 1962. Winner of the award for Outstanding Science Trade Books for Students K-12 for 2013, a cooperative project of the National Science Teachers Association (NSTA) and the Children’s Book Council. 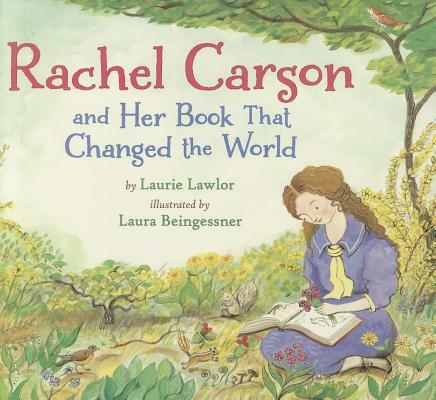 Laurie Lawlor's books have appeared on many notable lists, including the ALA Notable Children's Books, the ALA Best Books for Young Adults, and the Notable Social Studies Trade Books for Young People. Her Muddy as a Duck Puddle and Other American Similes was an IRA Teacher's Choice. She lives and teaches in the Chicago metropolitan area. Laura Beingessner is the illustrator of several books for children, including Our Corner Grocery Store by Joanne Schwartz, which received a starred review from School Library Journal, and If the Shoe Fits by Laura Whipple, winner of the William Allen White Children's Book Award. She lives in Toronto, Canada.